Glasses. I have wasted more money on over-priced, under-performing, and just plain unnecessary glasses than I have on bad liquor. And I’m sure I’m not alone (although the scale might be a little different in my case). Cocktail books and bar guides are the first culprit here. I’m looking at my first cocktail book right now and it specifies 8 basic glasses and 4 others that you really should own if you’re going to do this right. I dare you: buy a dozen of each and find a place to put them. Second is the retail housewares store. They not only stock those 12 different glasses, but they have many fancy, expensive versions of them. In nearly any department store you can buy a $37 heavy rocks glass that you’ll break before the glue from the label washes off and a $26 festive wine glass that you’ll only use for summer parties. And both have to be washed by hand. It only gets worse at specialty stores. 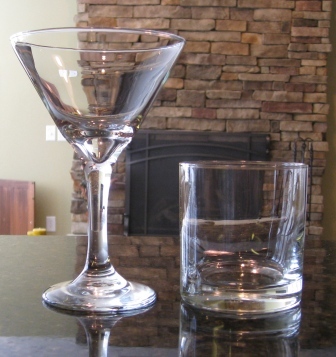 I once received a pair of $75 crystal cocktail glasses as a gift and I have barely used them — I’m afraid I’ll break them. In fact I had some $20 Riedel cocktail glasses that I liked a lot. But the second time I broke one while washing it, I decided that nothing about cocktails should be as stressful as washing those glasses. So then and there I went industrial. I made a trip to my local restaurant supply store and I bought a dozen replacements for less than a buck apiece. They worked so well that I eventually replaced all my bar glasses with cheaper, more durable restaurant glasses. I’ve also realized that all the varieties of containers are not only unnecessary but actually get in the way of good bartending. Check out any well-run cocktail lounge. They’ll have a couple more glasses than the local sports bar. But they’ll still have far fewer than most home bar books recommend. 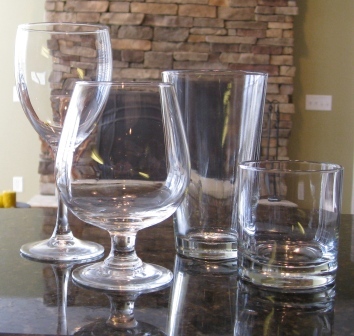 It’s just more efficient — cleaning, stocking, and chilling 4 types of glasses is more practical than 12. And it leaves you more time to make quality drinks. Also in favor of the cheaper restaurant glasses: the thicker glass stays colder longer, which is the point of chilling them in the first place. The only downside to these is that they are usually purchased in 1-3 dozen increments. But if 3 dozen glasses is $50, it’s still a bargain. I’ve vastly simplified my glass arsenal over the years– I make 3/4 of my recipes using 2 glasses: a 9-1/4oz. cocktail and 10oz. highball (or double rocks) glass. And I guarantee nobody notices that they aren’t crystal glasses – they’re happy that they’re at a party and they’re getting a well-made drink in a chilled glass (and not a red plastic solo cup). I have a dozen pint glasses in my bar for water, soda, and beer. I’ll also use them for a tall highball, say at a 1:5 ratio, and they even double as the glass side of my boston shaker. I have some brandy snifters around that I use for Hurricanes or Pina Coladas. I have a dozen cheap wine glasses for parties that I will put Bellini’s in (and yes, I do have a few nice wine glasses for the right occasion). And I do allow myself one flyer on glasses — the small rocks or old fashioned glass (8 oz). It’s completely unnecessary. After all, can’t you just fill the larger rocks glass a little less for those smaller drinks? Yes, but I like the just-rightness of it — especially with a Pisco Sour. Cole at Fonda san Miguel turned me on to this one. This is my interpretation of his recipe, which is pretty typical for this drink and varies from my standard sour formula, which I’ll share with you at some point. Pisco is a Peruvian brandy that is distilled from grapes, is usually clear (in the U.S.) and has an earthy quality like tequila or grappa. You can sip it with or without a lime after dinner and you can make a decent Margarita variation with it. 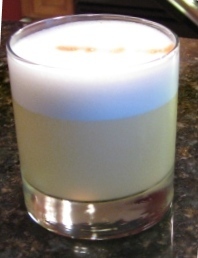 But it really shines in a Pisco Sour. Combine all but bitters and shake vigorously for a minimum of 1 minute. Strain into chilled old fashioned glass (no ice) and dash the bitters on the foam. Now you’re looking at the recipe and you’re saying, “An egg white?! ?” I promise this is a very old cocktail trick that makes drinks creamy/foamy without changing its overall nature. Many people will try to use cream or (God forbid) irish cream for this, but those always bring their own flavors that aren’t always wanted. Don’t do that! Trust me on this one – stick with the egg whites. Use pasteurized whites if you’re concerned about food safety; they won’t make as creamy or foamy a drink but will work just fine. In fact, that’s what I specify above — 3/4 oz is about the equivalent of 1 grade AA large egg white. And make sure you shake it REALLY well – you’re basically making a meringue. That’s why a specify a whole minute of shaking. This isn’t hard if you know how to shake properly. But we’ll get to that…. NOTE: I keep a few of all of these glasses in my bar fridge or freezer. This isn’t practical for everyone, but it really is critical for the cocktail glass and the small rocks glass. Because most of the drinks served in these are ‘neat’ or without ice, the cold glass is the ice. “The most important ingredient is a martini is temperature” says someone famous in some cocktail book I read. I would tend to agree about most cocktails. This entry was posted in Uncategorized and tagged Angostura, Bitters, Lime Juice, Pisco. Bookmark the permalink.